Short Description: KBpedia makes it easy to set up a supervised machine learner (SVM) to classifly arbitrary text into desired domain classes using a semantic vector representation (ESA) of the subject domain. Problem: We have arbitrary input text that we need to classify in ways that are of interest to us, from topics to sentiment, that we can also reason over. Approach: The KBpedia knowledge structure allows us to create labeled and domain-specific corpuses for training supervised, unsupervised and deep learning models. We can capture the semantic representation of our content using a variety of vector methods. In this use case, we use the supervised support vector machine (SVM) learner coupled with an explicit semantic analysis (ESA) representation of input content to create a binary classification model of high (97+%) accuracy. The creation of accurate domain and class-specific training sets is rapid (minutes), enabling the method's application to multi-class learners and to focusing on refining learner parameters for maximum performance. These single classifier advantages and benefits can also be applied to multi-classifiers. A common task required by systems that automatically analyze text is to classify arbitrary input text into one or multiple classes. To achieve this task a model needs to be created that scopes the class (what belongs to it and what does not) and then a classification algorithm uses this model to classify the input text. Multiple classification algorithms exist to perform such a task such as Support Vector Machines (SVM), K-Nearest Neighbor (KNN), the C4.5 algorithm and others. Applying one of these algorithms is not the hard part of the task; each of these approaches is generally easy to configure and most have implementations in a variety of programming languages. The hard part – which is also time-consuming – is to create a sound training corpus that will properly define the class you want to predict. Further, the steps required to create such a training corpus must be duplicated for each class you want to predict. Finally, we predict if an input text belongs to the class (scoped domain) or not. Note we are using a supervised machine learning approach (SVM) based on a semantic vector representation of the concepts (ESA) as its feature set. This use case can be used in any workflow that needs to pre-process any set of input texts where the objective is to classify relevant documents into a defined domain. Unlike more traditional topic taggers where topics are tagged in the input text with weights, we demonstrate how it is possible to use the semantic interpreter to tag main concepts related to an input text even if the surface form of the topic is not mentioned in the text. We accomplish this by leveraging ESA's semantic interpreter. Two corpuses are created in this use case: the general domain and the specific domain(s). The general domain is the potential set of all specific domains. The specific domain is one or multiple classes that scope a domain of interest; as such, it is a subset of the general domain. In KBpedia, the general domain is defined by all the ~55,000 KBpedia reference concepts. A specific domain is any sub-set of these that adequately scopes a domain of interest. These concepts also provide the entry into 30 million entities and supporting information mapped to these concepts. Via the combined KBpedia knowledge structure, it is possible to acquire sufficient labeled content for most any supervised learner for a multitude of domains, and well-bounded training corpuses for unsupervised and deep learners. The purpose of this use case is to show how we can determine if an arbitrary input text belongs to a specific domain of interest. What we have to do is to create two training corpuses: one that defines the general domain, and one that defines the specific domain. The common approach is to create these training sets manually, which takes much time with high cost. This labeling or scoping requirement is the Achille's Heel of any machine learner. The advantage arises from the ability to leverage the KBpedia knowledge graph to automatically generate the reference concepts underlying the general and specific domains. Via the linkages of KBpedia to its constituent knowledge bases and their 30 million entities, we can also generate labeled training sets and domain corpuses sufficient to drive virtually any supervised or unsupervised machine learner. We can also rapidly create "gold standards" for testing different models, algorithms, or parameters. These are the steps that provide the real performance improvements. The first step is to define the general and domain training corpuses for the semantic interpreter and the SVM classification models. The example domain for this use case is Music, as enhanced by the concepts of Musicians, Music Records, Musical Groups, Musical Instruments, etc. Note how easy this is made by the KBpedia structure, in that we only need query it and then write the general corpus into a CSV file. This CSV file will be used later for most of the subsequent tasks. The next step is to define the training corpuse of the specific domain for this use case, the music domain. To do so, we now will use the broader KBpedia structure to search for all of the reference concepts relevant to the music domain. These domain-specific KBpedia reference concepts provide the features set for the SVM models we will test below. What the define-domain-corpus function below does is simply to query KBpedia to get all of the Wikipedia articles related to these concepts, their sub-classes and to create the training corpus from them. Our use case is based on a binary classifier. However, we could create a multi-class classifier by defining multiple specific domain training corpuses in exactly the same way. The only additional time required would be to search KBpedia to find the reference concepts we want for the additional desired classes. Once the training corpuses are defined, we want to cache them locally to be able to play with them, without having to re-download them from the Web or re-create them each time. The cache is composed of 24,374 Wikipedia pages, which is about 2 GB of raw data. However, we have some more processing to perform on the raw Wikipedia pages since what we ultimately want is a set of relevant tokens (words) that will be used to calculate the value of the features of our model using the ESA semantic interpreter. Since we may want to experiment with different normalization rules, what we do is to re-write each document of the corpus in another folder that we will be able to re-create as required if the normalization rules change in the future. We can quickly re-process these input files and save them in separate folders for testing and comparative purposes. Normalization steps could be dropped or others included, but these are the standard ones that might be applied in a baseline configuration. After cleaning, the size of the cache is now 208M (instead of the initial 2G for the raw web pages). Note that unlike what is discussed in the original ESA research papers by Evgeniy Gabrilovich we are not pruning any pages (the ones with less than X number of tokens, etc.) This could be done but at a subsequent tweaking step, which our results below indicate is not really necessary. Now that the training corpuses are created we can now build the semantic interpreter to create the vectors that will be used to train the SVM classifier. What we want to do is to classify (determine) if an input text belongs to a class as defined by a domain. The relatedness of the input text is based on how closely the specific domain corpus is related to the general one. 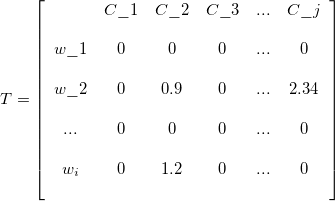 This classification is performed with some classifiers like SVM, KNN and C4.5. However, each of these algorithms needs to use some kind of numerical vector, upon which the actual classifier models and classifies the candidate input text. Creating this numeric vector is the job of the ESA Semantic Interpreter. Let's dive a little further into the Semantic Interpreter to understand how it operates. Note that you can skip the next section and continue with the following one. How Does the Semantic Interpreter Work? The Semantic Interpreter is a process that maps fragments of natural language into a weighted sequence of text concepts ordered by their relevance to the input. Each concept in the domain is accompanied by a document from the KBpedia Knowledge Graph, which acts as its representative term set to capture the idea (meaning) of the concept. The overall corpus is based on the combined documents from KBpedia that match the slice retrieved from the knowledge graph based on the domain query(ies). The corpus is composed of concepts that come from the domain ontology associated with KBpedia knowledge structure documents. We build a sparse matrix where each of the columns corresponds to a concept and where each of the rows corresponds to a word that occurs in the related entity documents . The matrix entry is the TF-IDF value of the word in document . and where the document frequency is the number of documents where the term appears. Unlike the standard ESA system, pruning is not performed on the matrix to remove the least-related concepts for any given word. We are not doing the pruning due to the fact that the ontologies are highly domain specific as opposed to really broad and general vocabularies. However, with a different mix of training text, and depending on the use case, the stardard ESA model may benefit from pruning the matrix. where is the TF-IDF weight of the word in the concept document , where is the square root of the sum of exponent of the TF-IDF weight of each word in document . This normalization removes, or at least lowers, the effect of the length of the input documents. The first semantic interpreter is composed of the general corpus, which has 24,374 Wikipedia pages, and the music domain-specific corpus, composed of 62 Wikipedia pages. The 62 Wikipedia pages that compose the music domain corpus come from the selected KBpedia reference concepts and their sub-classes that we defined in the Define The Specific Domain Training Corpus section above. Before building the SVM classifier, we have to create a gold standard that we will use to evaluate the performance of the models we will test. This is a standard step with all of Cognonto's machine learners. For this use case, we aggregate a list of news feeds from the CBC and from Reuters and then crawl each of them to get the news content. Each news feed document is manually classified. The result is a gold standard of 336 news pages, classified as being related to the music domain or not (the basis for a binary classifier). It can be downloaded from here. Because of the logical structuring within KBpedia, we can classify these feeds in minutes. For comparative purposes, we also created a second gold standard that has 345 new spages. It can be downloaded from here. We use both to evaluate the different SVM models below. What these functions do is to calculate the number of true-positive, false-positive, true-negative and false-negatives scores within the gold standard by applying the current model, and then to calculate the precision, recall, accuracy and F1 metrics. You can read more about how binary classifiers may be evaluated from here. Now that we have numeric vector representations of the music domain and a way to evaluate the quality of the models we will be creating, we can now create and evaluate our prediction models. This initial model is created using a training set that is composed of 24,311 documents that do not belong to the specific class (that is, the music domain), and 62 documents that do belong to that class. This first run looks to be really poor! The issue here is a common one with how the SVM classifier is being used. Ideally, the number of documents that belong to the class and the number of documents that do not belong to the class should be about the same. However, because of the way we defined the music specific domain, and because of the way we created the training corpuses, we ended up with two really unbalanced sets of training documents: 24,311 that do not belong to the class and only 62 that do. This sample imbalance is one reason why we are getting such poor results. We add thousands of new documents that belong to the class we want to predict. Let's test both options. We will initially play with the weights to see how much we can improve the current situation. What we will do now is to create a series of models that will differ in the weight we will define to improve the weight of the classified terms in the SVM process. This is already a clear improvement for both gold standards. Let's see if we continue to see improvements if we continue to increase the weight. The general metrics continue to improve. By increasing the weight, the precision dropped a little bit, but the recall improved quite a bit. The overall F1 score significantly improved. Let's see with the Weight at 50. Results are the same, it looks like improving the weights up to a certain point adds further to the predictive power. However, the goal of this use case is not to be an SVM parametrization tutorial. Many other tests could be done such as testing different values for the different SVM parameters like the C parameter and others. Now let's see if we can improve the performance of the model even more by adding new documents that belong to the class we want to define in the SVM model. The idea of adding documents is good, but how may we quickly process thousands of new documents that belong to that class? Easy, we will use the KBpedia Knowledge Graph and its linkage to entities within the KBpedia knowledge structure to get thousands of new documents highly related to the music domain we are defining. The millions of completely typed instances in KBpedia enable us to retrieve such large training sets efficiently and quickly. To extend the music domain model we added about 5000 albums, musicians and bands documents using the relationships querying strategy outlined in the figure above. What we did was to add three (3) new features, that result in actually adding thousands of new training documents in the corpus. Build a new SVM model that uses the new semantic interpreter's output. Bingo! it is that easy to significantly expand our training basis. Just like what we did for the first series of tests, we now will create different SVM models and evaluate them. Since we now have a nearly balanced set of training corpus documents, we will test much smaller weights (no weight, and then 2 weight). The performances are just getting worse. But this makes sense at the same time. Now that the training set is balanced, there are many more tokens that participate into the semantic interpreter and so in the vectors generated by it and used by the SVM. If we increase the weight of a balanced training set, then this intuitively should re-unbalance the training set and worsen the performances. This is what is apparently happening. Re-balancing the training set using this strategy does not look to be improving the prediction model, at least not for this domain and not for these SVM parameters. So far, we have been able to test different kinds of strategies to create different training corpuses, to select different features, etc. We have been able to do this within a day, mostly waiting for the desktop computer to build the semantic interpreter and the vectors for the training sets. It has been possible thanks to the KBpedia knowledge graph that enabled us to easily and automatically slice-and-dice the knowledge structure to perform all these tests quickly and efficiently. There are other things we could do to continue to improve the prediction model, such as manually selecting features returned by KBpedia. Then we could test different parameters of the SVM classifier, etc. Such tweaks are the possible topics of later use cases. As we saw, we can easily define domains by selecting one or multiple KBpedia reference concepts and all of their sub-classes. This general process enables us to scope any domain we want to cover. Then we can use the KBpedia knowledge graph's relationship with external data sources to create the training corpus for the scoped domain. Finally, we can use SVM as a binary classifier to determine if an input text belongs to the domain or not. However, what if we want to classify an input text with more than one domain? This can easily be done by using the one-vs-rest (also called the one-vs-all) multiclass classification strategy. The only thing we have to do is to define multiple domains of interest, and then to create a SVM model for each of them. As noted above, this effort is almost solely one of posing one or more queries to KBpedia for a given domain. Finally, to predict if an input text belongs to any of each domain models we defined, we need to apply an SVM option (like LIBLINEAR) that already implements multi-class SVM classification. This use case tests multiple, different strategies to create a good prediction model using SVM to classify input texts into a music-related class. We tested unbalanced training corpuses, balanced training corpuses, different set of features, etc. Some of these tests improved the prediction model; others made it worse. The key point that should be remembered is that any machine learning effort requires bounding, labeling, testing and refining multiple parameters in order to obtain the best results. Use of the KBpedia knowledge graph and its linkage to external public datasets enables us to now do these previously lengthy and time-consuming tasks quickly and efficiently. Within a few hours, we created a classifier with an accuracy of about 97% that classifies input text to belong to a music domain or not. We demonstrate how we can create such classifiers more-or-less automatically using the KBpedia Knowledge Graph to define the scope of the domain and to classify new text into that domain based on relevant KBpedia reference concepts. Finally, we note how we may create multi-class classifiers using exactly these same mechanisms. KBpedia exploits large-scale knowledge bases and semantic technologies for machine learning, data interoperability and mapping, and fact extraction and tagging. 2016-2019 © Cognonto Corp. All Rights Reserved.